NFPA Vol. 1977, 2011 Ed. It's all on this page. Scroll down to see everything. Cosmas Hercules V2 - Revolutionary New Wildland Fire Boot! Certified to NFPA Vol 1977, 2011 Ed. Includes our local stock plus stock available from Cosmas. as "X" instead of "EEE"
So a pair of 10 EEE boots is marked "10 X"
High quality, very comfortable 9" leather mountaineering / hiking boots with NFPA wildland fire certification. Mountain inspired design. First true mountaineering boot designed for wildland fire fighting. Certified by UL Labs to meets or exceed the updated NFPA Vol. 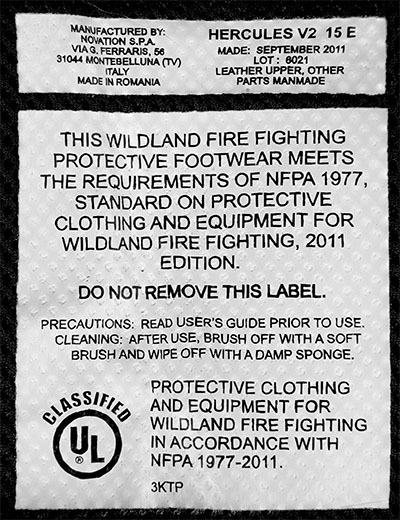 1977, Standard on Protective Clothing and Equipment for Wildland Fire Fighting, 2011 Edition. That means these boots are NFPA certified for the 2018 season and beyond. Most comfortable and technically advanced wildland fire boots available. 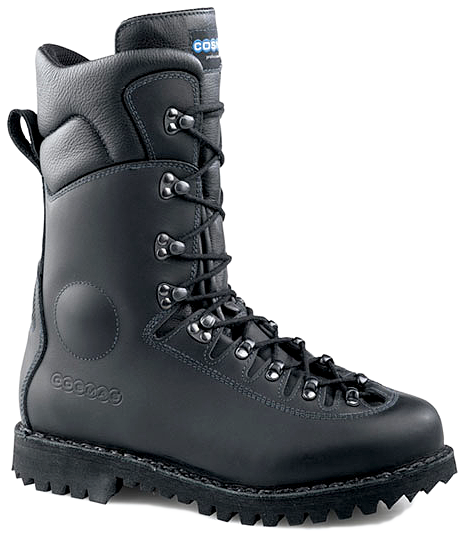 Taller than mountaineering boots for added protection and with NFPA specified fire safety features in its construction. Yet this boot is lighter than conventional hiking / mountaineering boots. Cosmas boots have an exclusive 3-year 100% factory warranty, which covers not only manufacturer’s defects, but also covers premature wear & tear of their products. Simply put, if anything wears out on Cosmas boots within 3 years, Cosmas will replace the boots for free. Leather: Thick (6.5 ounce / 2.6mm) full-grain water, flame, chemical, and cut resistant leather. Durable, one-piece upper construction. Fewer seams means more durability. Thread: Tough, fire-resistant Nykev continuous multifilament para-aramidic thread made with Kevlar® throughout the upper ensures durability under fire conditions. Outsole is stitched in forefoot area with tough, fire-resistant Kevlar® thread. Soles: High traction, abrasion resistant, oil, flame, and chemical resistant, nitrile rubber outsole equipped with ergonomic HeelRoll™ and ToeSpring™ to promote a natural walking motion. Mountaineering lug design provides maximum traction. Multi-directional lugs provide sure-footed edging, braking, kickoff, and stability. High profile ladder grips for gripping on roots, branches, sticks, stones and, of course, ladders. Specially formulated compound (nominal durometer 66 Shore A) provides superior traction without sacrificing abrasion resistance or durability. Welted construction allows for sole replacement. Sole attachment: 2 component, high temp polyurethane adhesive system bonds the outsole to the midsole then the sole is stitched to the midsole in forefoot area with tough, thick, fire-resistant Kevlar® thread. MidsoleArmor™: a unique and innovative integrated lightweight midsole design combines the functionality of the midsole, ladder shank, and puncture protection into a single component. The combination composite anti-puncture plate / ladder shank / midsole provides full puncture resistant coverage and thermal insulation for the bottom of the foot. This Cosmas® exclusive, patent-pending construction is stiff and supportive in the heel and arch, yet flexible in the forefoot, allowing your foot to flex naturally. Combining 3 functions into one component saves weight and bulk. Markings: Interior label contains all information required by NFPA Vol. 1977 Standard on Protective Clothing and Equipment for Wildland Fire Fighting, 2011 Edition. Dual-Zone Contact™ Lacing System. Anatomically asymmetrical, with free floating lace points that allow the upper to conform precisely to the shape of each individual's foot. Bi-zonal Lacing: 100% Kevlar® braided laces. The first speed hook is a lace lock, allowing you to tighten the boot in the forefoot area, lock the lace, then tighten the upper part of the boot for a custom fit. Pull Strap: Low profile, 1" wide, triple-stitch reinforced, full-grain water and flame resistant leather to help pull on your boots. Welted construction allows for resoling, extending the life of your boots. Footbed: Triple-density, removable, ventilated, anti-microbial footbed made of microfiber suede, felt, and ergonomically molded EVA. Wicks moisture and dries rapidly. EVA provides cushioning. Molded EVA heelcup and arch conforms to your foot providing comfort and support. Insole: Texon®, anti-microbial; wicks perspiration and dries quickly; lightweight with excellent flex endurance. 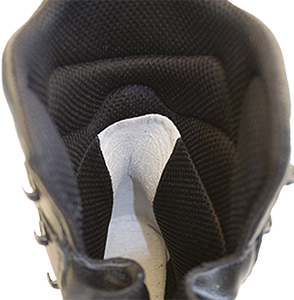 Heel pad: Internal heel pad cushions and supports the heel and detents the heel to prevent slipping. Heel Slide: Abrasion resistant microfiber suede heel slide along the back of the boot shaft. No stitching or seams running directly down the center of the backstay in the heel area to improve comfort and prevent premature wear of the liner. The heel slide smoothly eases your foot into and out of the boots. Boots slide on easier and then stay on. Padding: Strategically placed throughout the upper for superior comfort, support and protection. Soft, full grain leather collar ensures comfort. AnkleArmor™ contoured ankle guards protect ankles from knocks and dings. Lace-to-toe design. Laces extends all the way to the toe to ensure a precision fit. Here's the story behind these revolutionary wildland fire boots. Lots of wildland fire fighters in the US and Canada have started wearing mountaineering / hiking / backpacking boots instead of traditional logger boots. The hiking / mountaineering boots are designed for the type of work they do all the time... climbing hills and mountains while carrying heavy gear. The problem was that the standard mountaineering / hiking boots were great for the task but lacked safety features needed while fighting wild fires. Cosmas stepped in with a revolutionary boot based on an update to traditional mountaineering boot design. That initial boot design was fire tested in the field then modifications were made to the original design based on feedback from wildland fire fighters who spent a season wearing the first design. The result was the current Hercules V2 boot which is a bit higher than the original, has a one piece upper design and incorporates many suggestions from wildland firefighters. It has been very well received and we're proud to be carrying this boot. If you don't have any fires to fight, you'll find that this is a great boot for general purpose hiking, backpacking and mountaineering. 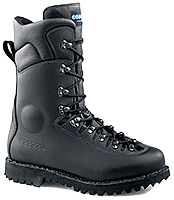 Not many hiking boots are available in this range of sizes and widths and at this great price. These boots are designed to fit accurately when worn with standard boot socks. So they match the standard US men's sizes. Unlike many fire boots, particularly traditional rubber boots, these are not loose and sloppy in their fit. Cosmas does not add extra room to the sizing. Our advice for fitting these boots is to measure your feet to determine your US men's foot size then pick a boot in that size. They don't include extra room to make them larger than sized. So, if there's any uncertainty on the size to pick, go up a half size. Some customers say the boots feel slightly small when new (maybe ½ size) but they usually find the fit to be just right after the boots are broken in a bit. This is typical with any boots which have a padded lining like these do. If you normally wear extra heavy boot socks, (or multiple pairs but not counting thin polypropylene, CoolMax or silk liner socks) you should go up ½ size from your US men's foot size when you order. In our wear testing we've found these boots to work well and fit comfortably when worn with standard boot socks. Finally, we advise that you always avoid cotton socks. See our FAQ discussion about socks here.